Kale Caesar Salad – Dressed and Ready to Go! We all have those days that are packed full, and we need to eat on the run. When I was at the Patrick Island Market the other day, I had to take something with me for lunch so I took a roasted chicken Caesar salad. 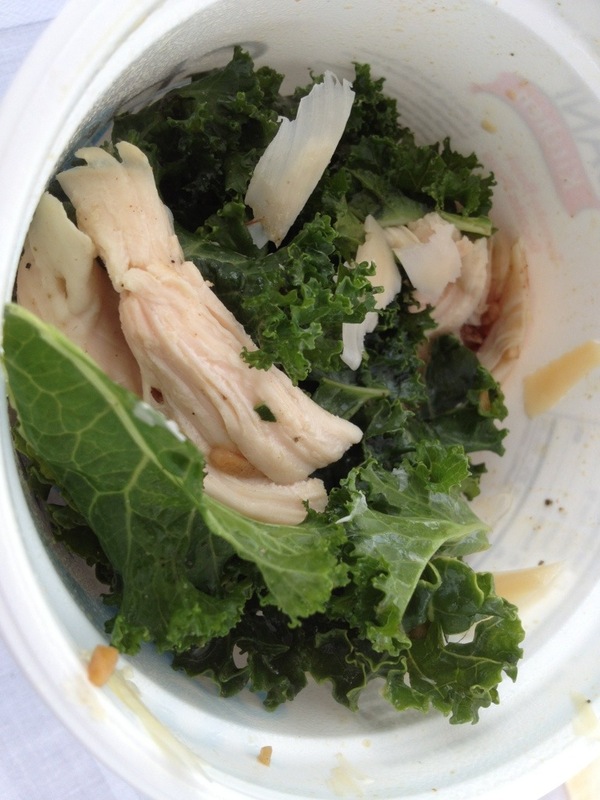 To make it an extra-easy meal, I wanted it already dressed and ready to be eaten so I used kale rather than romaine. The heartiness of the kale keeps the salad from wilting because we all know that soggy salads are not so scrumptious. I placed my salad in one of my washed out Chobani yogurt containers (32 oz one), placed a plastic fork in it, and snapped on the top. At lunchtime, I grabbed my Chobani container, popped it open, and lunch was served!